Part of the Reelfoot National Wildlife Refuge Complex in western Tennessee, the Chickasaw National Wildlife Refuge is located six miles west of the town of Ripley in Lauderdale County. 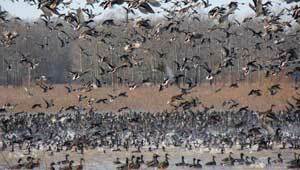 The Migratory Bird Conservation Commission approved the refuge on May 14, 1985, to protect approximately 37,500 acres of bottomland hardwoods and adjacent habitats for migratory waterfowl. Each year, some 130,000 people take advantage of recreational and educational opportunities that are open to the public, such as hunting, fishing, bird watching, and nature photography. TPL's Chattanooga office works hand in hand with the United States Fish and Wildlife Service, and the Chickasaw National Wildlife Refuge Manager to protect land within the refuge boundary.